This is fast becoming my favourite regular feature, as it makes me look forward to what theatre I treat myself to every month! Over at the Guardian, which is one of my favorite reads for theatre and performing arts opinions and reviews, Lyn Gardner has a weekly version of theatre that she intends to see every week. As I don’t go that often like most critics do, (I wish!) I do envy the likes of Natasha Tripney of Interval Drinks who not only writes reviews in her own blog but also reviews for musicOMH, and contributes as freelance theatre critic to the Guardian, The Stage, New Statesman no wonder she gets to sees tons of theatre every week. You’re living the dream Tasha! Not that I am keeping score but it looks like I will be hanging out at the National so many times this month, so if you happen to be around, don’t be a stranger and say hello! Plot: When Dr Tomas Stockmann (Greg Hicks) discovers dangerous impurities in the water supply feeding the town baths he insists that the baths will be closed while repairs are carried out. The initial support for him dwindles when it becomes clear that local businessmen, led by his own brother, the town’s Mayor (Christopher Godwin), are facing enormous expense and loss of visitor income. With friends and allies turning against him, Tomas is branded ‘An Enemy of the People’. The play has many resonances for today’s society, touching on the power of the media and the need for political expediency balanced against economic considerations. The play written by Henrik Ibsen, in an adaptation by Rebecca Lenkiewicz and directed by Arcola’s Mehmet Ergen, is a timeless drama about the true cost of honesty. Dr. Stockmann wants to protect lives by telling the truth, but his revelations may cost his town its livelihood. Is it possible to be an honest man in a town built on lies? Or is ruthless consumerism always going to win out over morality? Whew! Among all my favorite playwrights, I have to say that Ibsen always makes me sweat. And think. This is now my 3rd Ibsen production, where my love affair started with Pillars of the Community (2006, National Theatre) followed by John Gabriel Borkman (2007, Donmar), up next is Arcola’s The Lady from the Sea and then the Almeida’s Rosmersholm, both in May and I know what’s going to happen again, I’ll sweat and then I’ll think some more. I have to quote the Guardian’s Michael Billington and agree with him that this production is Ibsen stripped to the bone delivered with rare urgency. The first act seemed promising for Dr Stockmann, played quite compellingly here by Greg Hicks, after he found out about the contaminated baths and was so assured that everything will go his way as his friends and supporters rallied behind him. And then we see it spiralling all the way down from there with the morality questions, would closing the baths which would mean lost revenue for the village is actually for the greater good or is it worth to make one an enemy of the people because of one’s honesty? I truly loved this production and was quite impressed with Hicks performance who played a sympathetic character as Stockmann but was not about to give up. The actress playing his daughter Petra, Fiona O’Shaughnessy, reminded me of Rachel Weisz but with a husky voice. It was also my first visit at the Arcola which is much closer to home as it’s just up the road in Dalston. As we were ushered in Studio 1, we were warned not to trip over the body of water as we made our way to our seats, which of course was part of the props as the baths. Clever huh? For a Monday evening the crowd turnout was quite impressive but I wasnt surprised with this because of all the very good reviews that the play has been getting. It’s all posted on the Arcola bar for us to see. I particularly liked that the program which also worked as a play text, without too much adverts. I’d say other theatre companies should follow suit. 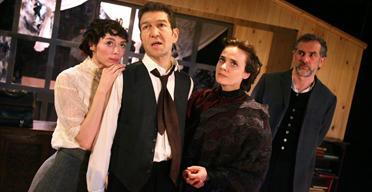 If you haven’t seen an Ibsen play, this is your chance to do so. Just don’t mind the sweating and the thinking.